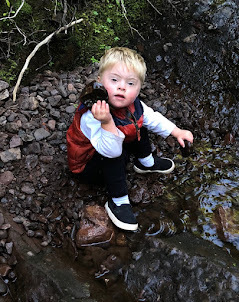 As a mother of a child with Down syndrome, I often feel like we (all the people involved in this little man's life) are a minority. Most people do not experience the same repetitive challenges, moments of pride or depth of love that our family endures on a daily basis. Before I go more into that, let me say that I am grateful for this unique adventure. I sometimes feel a bit separated from other people because they might not know how to talk to us or even want to engage with us because Braeden is different. But discomfort provokes a need for change. And these changes have induced strength and purpose in myself and everyone else who loves him. I know Brady P. won't just get by in a regular school with regular classes and regular friends without any extra effort. His education would take a huge hit. Same with his medical life. He doesn't just get by with the annual well-child appointment. He has seen specialists from soon after his time of birth and will continue to all his life. And the normal "cold" for him can turn into a panic attack as he struggles for a breath through his abnormally small passageways. So, as his mother, I have to be proactive. I do research. I make phone calls. I attend meetings. I join groups. I take him to therapy appointments. And then I take the tools I have earned and use them the best I can to build an enriching life for Braeden. It takes a staggering amount of time and energy. But as a middle-aged white woman, I wouldn't know what it's like to be a minority if I didn't have Braeden. It is humbling, yet empowering to have this extra work placed upon me. And I feel like I have more of a voice because we have different needs. The spotlight mysteriously shines in our direction. But we are not just different, we are extra. Brady P. has an extra chromosome. I know I've said this before, but it makes him more and not less. I've written about how his hugs make people's day. I've written about how his sweet little voice saying someone's name melts their heart. I've written about how looking into his eyes shows you the depths of the universe. That, my friend, is all extra. So what can a person do when they feel like most people don't understand them? Get with the other people in their minority group! That's what we did last Saturday. 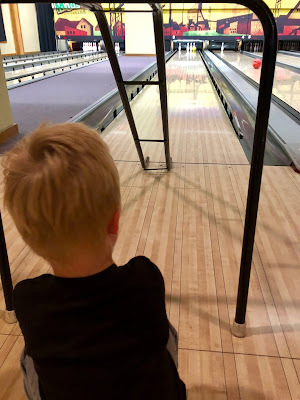 Grammy Linda, Brady P. and I went to the Mine Shaft bowling alley for the annual back to school party put on by the U.P. Down Syndrome Association. Every person who goes to those events is extra. The spotlight kids have an extra chromosome which exudes extra light. Their siblings show extra love and learn extra patience. The parents are extra real, extra supportive, extra understanding and just down right extra cool. I cannot express how much it means to me to be in a group of people who have all been humbled, yet empowered by the child that blessed their lives. I don't think anyone who truly loves, cares for and advocates for a person with Down syndrome could even fathom putting on a facade for the sake of popularity. Because that special person in their life has taught them that it doesn't matter. It's what's inside that counts. It's how we affect others that matters. And Brady P. continues to teach me and all the people in his life that. We are all able to see a more meaningful side to life, which humbles our ego. Yet, at the same time, a true knowing of what is important in this life is then able to rise from within -- and that is the strength and purpose we find. I am fortunate to experience this on a daily basis. And I am grateful through and through. And, as a writer, I am moved to share it with everyone who does not experience it first hand... and I hope that the world will be able to see it with a little extra light.